In the Valentines Math Solve and Snip for Sixth and Seventh Grade, students will read a word problem involving proportions and then solve the problem by showing work in the show work area. Then once they have solved their problem, they will find the correct answer in the solutions bank and glue it in the answer column for the correct problem. What is a Solve and Snip you may be asking. 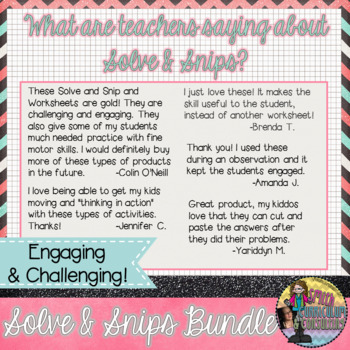 A "Solve and Snip" is an interactive set of word problems, aligned to standards, that allow students to not only practice working with word problems but also have students working to solve problems with only a given set of answers provided. This allows self-checking an instant feedback on correct and incorrect answers. Aligned to TEKS 7.1b, 7.3a and 8.3b as well as Common Core State Standards (CCSS) for 6.RP.3c and 7.RP.3.